charging - Boolean representation of the charge status. 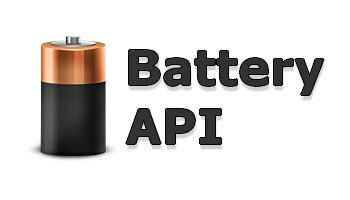 If the battery is charging, the state isn't determinable or the system has no battery it will return true and false if the battery is discharging. chargingTime - Double representation of the remaining time to fully charge the battery in seconds. Returns positive infinity if the battery isn't charging or it isn't possible to get the remaining charging time. dischargingTime - Double representation of the remaining time until the battery is discharged. Returns positive infinity if the battery is charging or it isn't possible to get the remaining discharging time or no battery is attached. level - Double representation of the current charge status between 0.0 and 1.0. You could try the online demo.